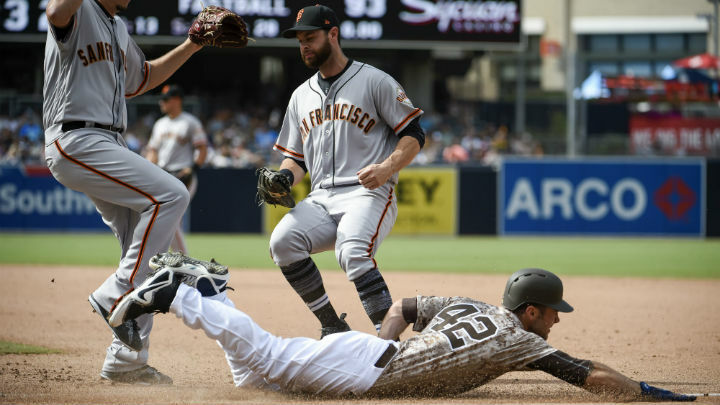 Military Opening Day at PETCO Park was a rousing success, as the Padres’ offense exploded for a season-high 10 runs en route to a series win against the San Francisco Giants. The Giants scored first, putting up their one and only run in the top of the second inning against rookie starter Joey Lucchesi. Former Padre catcher Nick Hundley led off the inning with a single and went from first to third on an Evan Longoria base hit. 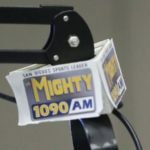 Lucchesi got the Giants’ left fielder Hunter Pence to strike out swinging on a curveball for the first out of the inning, but first baseman Brandon Belt followed with a fly ball to right-center field that scored Hundley and gave the Giants a temporary lead. Lucchesi bounced back nicely, striking out Kelby Tomlinson to end the inning. 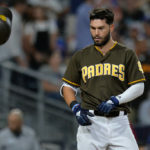 Save for a first-inning walk from Freddy Galvis and a seeing eye single from Carlos Asuaje in the second, the Padres couldn’t put much together their first time through the lineup. It was quickly looking like one of those games as Giants starter Tyler Beede struck out four batters his first time through the lineup. With two outs in the third, however, the Padres broke through as Galvis walked for the second time and Franchy Cordero followed with a hard-hit single. Clean-up hitter Christian Villanueva pulled a fastball down the left field line, plating Galvis and Cordero while giving the Padres a 2-1 lead. The Friars wouldn’t look back as they scored at least one run in each inning from the third to the seventh, all while holding the Giants to one lone run. Beede was taken out of the game in the fourth inning, but the damage had already been done. Chase Headley led off the inning with a walk and scored on a double to left-center field by Cory Spangenberg. Beede got Austin Hedges to pop up before striking out Joey Lucchesi, and looked to be out of trouble, but a red-hot Jose Pirela had other plans. His ground rule double down the left field line scored Spangenberg to make it a 4-1 game while a single by Galvis allowed Pirela to score and push the lead to 5-1. Halfway to 10, the offense did not let up. Christian Villanueva greeted lefty Josh Osich in the fifth inning with a first-pitch laser that ended up in the second deck of the Western Metal Supply Co. building, giving him five this year. Pirela was at it again in the sixth, singling and stealing second base. Franchy Cordero had arguably the best at-bat of the day, falling behind 0-2 before working the count full and lining a 107.7 mph base hit to right field, scoring Pirela. Cordero did this against a lefty in Josh Osich, which is a great sign as he needs to prove that he can hit left-handers on a consistent basis. At this point, the Padres were up 7-1 and the Giants were forced to bring in their fourth pitcher of the day, right-hander Derek Law. A Cory Spangenberg walk and a Matt Szczur single put runners at first and second with two outs in the bottom of the seventh inning. Pirela then lined a first pitch fastball to right field, over Andrew McCutchen’s head and all the way to the wall. By the time Pirela slid into third base for his second triple of the year, the Padres had picked up two more runs. Galvis walked for the third time and Cordero proceeded to smoke a ground ball to second baseman Joe Panik, but the usually sure-handed fielder booted it for an error, allowing Pirela to score the team’s 10th run of the day. That would be all for the Padres’ offense as three Padres pitchers combined to strike out 12 Giants in the lopsided victory. Lucchesi, Jordan Lyles, and Kyle McGrath did a good job keeping the opposition off balance, and that showed in the final result. Lyles pitched the seventh, working around a leadoff double to escape unscathed. McGrath worked the eighth and ninth, racking up two strikeouts and giving the rest of the bullpen a much-needed day off. 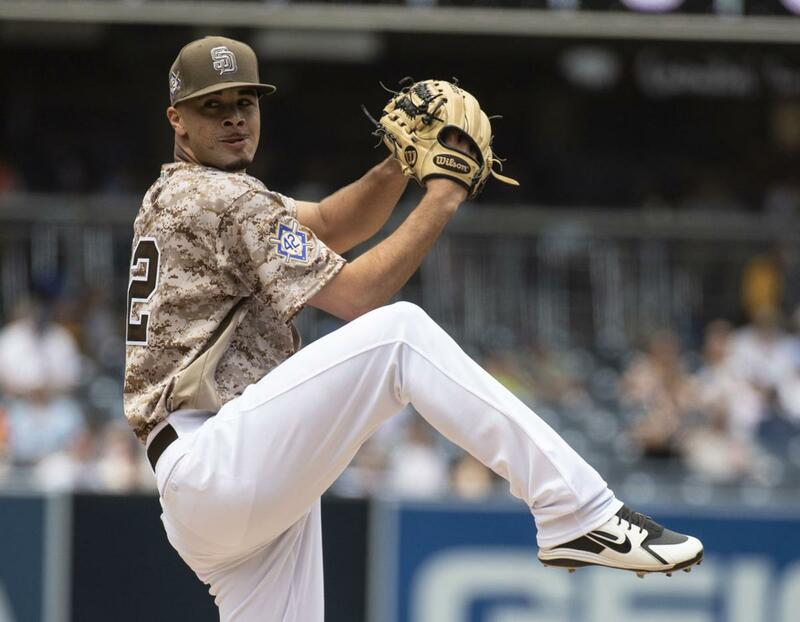 Lucchesi was phenomenal, pitching six strong innings while giving up five hits and one run. He struck out nine hitters, a new career high, and he also failed to issue a walk. Through four starts, Lucchesi has dazzled on the mound. Opponents are batting .221 against him and he has struck out 25 batters over 21.2 innings as opposed to just four walks. 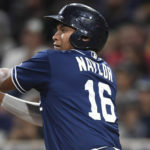 After a shaky debut where he failed to get out of the fifth inning, the rookie has improved from start to start and has thrown his name squarely into the discussion for potential National League Rookie of the Year candidates. 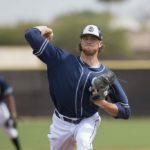 He will carry a sparkling 1.66 ERA into his next start against the Arizona Diamondbacks as he will be tested yet again against a tough lineup. Jose Pirela started in right field today, going 3-5 with three RBI and a stolen base. Pirela is currently tied for second in the MLB with seven doubles. He also leads all of baseball in hits with 24. He has been given a prime opportunity to rack up a large number of at-bats and has definitely delivered. Whether manager Andy Green decides to keep him in the leadoff spot will be quite interesting as he has thrived in the role thus far. Christian Villanueva showed off his power in this one, but also struck out a couple of times. 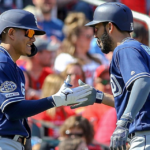 It seems as though the rookie third baseman is going to be a boom-or-bust type of hitter, but that power potential is very enticing and it is great that the team decided to let him roll with the third base job. Villanueva’s home run in the fifth moved him into a first-place home run tie with Braves second baseman Ozzie Albies amongst National League rookies. Both have five home runs as of this writing. Freddy Galvis walked three times today, bumping his season total up to 12. He walked 45 times last year and is primed to break that total this year. Galvis currently has a .435 OBP through 17 games, leading the team. Franchy Cordero showed off his exciting tools today, even in failure. After striking out in the first inning, Cordero put four balls in play, with authority. His second inning single had an exit velocity of 105.2 and his fourth inning groundout left the bat at 89 mph. His seven-pitch at-bat in the sixth led to a single with an exit velocity of 107.7 and then in his last at-bat of the game he scorched a ball at 115.5(!!!!) mph which led to an error for Joe Panik at second base. Franchy also had a steal in the sixth and showed very well in the field. It is great to see the young man fully healthy and performing well at a premium spot in the lineup. The Friars stole three bases on Sunday, almost doubling their season total of four before play started. 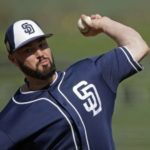 It is surprising to see how the Padres have neglected to steal many bags, but expect that number to increase as the season goes on. 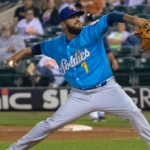 Joey Lucchesi has demonstrated impeccable control in his short time in the show. Of his four walks allowed, three of them came in his second career start when he faced the Rockies at PETCO. Since then, he has walked one batter while striking out 17 and giving up one earned run across 12 innings (two starts). The Padres currently carry the third-best ERA in the National League. After Sunday’s game the team’s ERA stands at 3.10. 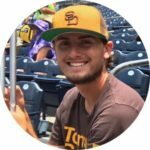 The 10 runs that the Padres scored against the Giants today was the first time they scored 10 or more runs since September 8th 2017 against the Diamondbacks. This wins marks two-straight series wins for San Diego, putting them at 7-10 so far in the season.